To be a healed community of individuals and families with members who have access to the services they need. The community supports the cultural, spiritual, emotional, mental and physical needs of the people. Our vision for health services is a system that is effective, community-based, accessible and collaborative. We believe that this will be best accomplished through the establishment of a community-based health care service with an interdisciplinary team of health care workers. 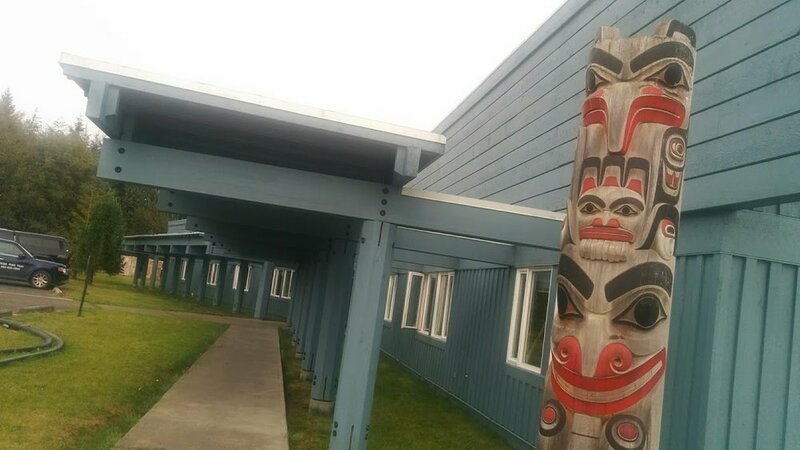 This approach recognizes the importance of ensuring that care is provided by the right health care worker and facilitates accessibility to the most appropriate health care services, specialized expertise on- and off-reserve, and on and off Haida Gwaii. We recognize the importance of initiating and strengthening partnerships with other health care providers and agencies and the coordination and integration of all health care services both through the Northern Health Authority, First Nations Health Authority. We recognize the importance of local capacity building and the promotion of self-responsibility for the health of the individual, the family and the community. We recognize the negative impact that historical, economic and social circumstances have had on all generations of our people. We understand the health status of our people today and the complex relationship between health and wellness and the cultural, environmental, social and economic conditions. We recognize that our vision and goals for the future are ambitious but they represent long term hope for the future of a healthier nation. Our vision establishes direction for political, administrative and program and service planning. The realization of the vision and goals will depend on community leadership that maintains focus - supporting healthy behaviours that improve the quality of life for individuals, families and the community. We recognize the importance of strong community leadership that supports the vision, goals and objectives of the Health Services within an atmosphere of cooperation and involvement. We believe that health is not only about the physical well-being of an individual but includes the cultural, emotional, mental and social well-being of the individual, the family and the community as a whole. • To improve access to appropriate health services for our people in the communities of Old Massett and Masset. • To build and maintain partnerships that enhance the capacity of the community to address all the determinants of health. • To create a physical and social environment that promotes the nurturing of children and youth and supports the elders and those with acute and chronic illness and disability. • To integrate, whenever possible, the delivery of health, mental health, social and education programs for the community. • To provide health services that demonstrate and promote respect for all community members, accepting each individual at their stage of the life cycle, where they are in their personal development and according to their specific needs. • To provide health services that identifies and focuses on strengths as a basis on which to build. • To provide health services that emphasize health promotion, health education, disease and injury prevention, and the management of chronic diseases. • To improve the overall quality of the health and wellbeing of the people by focusing on healthy behaviours. • To promote mental health and wellbeing to reduce the levels of mental-health-related social problems. • To create and support healthy families and community environments in which children and youth can thrive. To value each child and facilitate his/her development so she/he grows up in a safe environment with a sense of opportunity and excitement for the world around him/her and the ability to develop a healthy lifestyle and healthy relationships. • To provide every child with the best possible chance to grow up free from addiction and provide every individual who does develop a substance abuse problem with the support needed to achieve a healthier lifestyle. • To promote behaviours that prevent or delay the onset of chronic disease or disability. • To promote active involvement in community life through positive social support and interaction, participation in recreation programs as appropriate and/or participation in planning health promotion and social activities. • To promote activities that emphasize an awareness of health and wellbeing, encourage healthy behaviours and reduce high risk behaviours. • To address the challenges of food security by improving access to healthy foods for OMVC members. • To improve access to traditional foods for OMVC members. • To promote cultural awareness. • To plan and make health care decisions according to the most reliable data available. To establish community-based health surveillance, recording and reporting systems to improve the quality and accuracy of the data available. • To ensure privacy and confidentiality related to all health matters. • To promote activities which encourage reconciliation and unity in the community. Working within the context of the client-centered, family focused vision and goals of the OMVC Home and Community Care Program, the FNIHB Home and Community Care Program and in accordance with CRNBC Standards of Practice, the Home Care Nurse combines health sciences knowledge with assessment, supervisory and clinical nursing skills to effectively assess and coordinate client care for the OMVC Home and Continuing Care Program. The Home Care Nurse provides supervision of the Home Support Workers. The OMVC Home and Community Care Program assists and supports community members living with acute illness, chronic conditions or disability in maintaining optimal health, well-being and independence in their home and community. Community members living with illness or disability that restricts self-care but do not require acute care or continuous supervision are able to continue living at home for as long as desirable and feasible. Home and Community Care supplements the services provided by the primary care givers - it is not intended to replace the support and care traditionally provided by family members. bathing, dressing, grooming, toilet assistance. assessments, nail care, referrals to podiatry. A program that offers a safe and monitored exercise environment. Walking, yoga stretches, vital signs, and snacks. Elders safety program to prevent falls in the home. Meal preparation, shopping assistance, referrals to homemaking services. Help with exercise and activities. We respect the traditional role and responsibility of the family in providing help and support for Elders and those with physical challenges. Our staff can assist you in meeting these needs. The Haida Health Centre’s Home Care Program employs a Registered Nurse and three certified Home Support staff to deliver quality services. Please contact us with any questions, problems, concerns or comments you have regarding our services. Health teaching, blood pressure checks, wound care, post-operative assistance, escorts to local medical appointments, diabetes support, palliative and cancer care. Promote the philosophy in which the power and authority remains with the individual, the family and the community. The health staff act as facilitators and support the process of becoming healthy. Meet with individuals, families and community groups to develop trusting and respectful relationships with the community and to determine the priority health issues that the community wishes to address. Start where the community is at. Begin with the community’s felt needs and desires. Encourage maximum participation in situations where people can develop their own understandings and act on their own decisions. Develop an understanding of the socio-economic determinants of health, lifestyle and health related behaviours in the community and develop prevention strategies to address the health priorities identified by community members. Latasha Williams heads the MCH team. On Maternity Leave Fill in Blanche Bell. At the beginning of each session, the MCH team checks in with each mom/family and gives them their $50 Co-op voucher card. The moms’ have the power to choose what the topic will be and we encourage everyone there to engage in the conversation. We bring all of the toys to the gym and it is open for the babies/children to play and socialize with one another. We have had two sessions of Community Kitchen: Our goal is to make a healthy meal on a budget. It’s a good place to discuss baby’s first foods or how to tell when it’s time to introduce them to solids. Having a midwife provides continuity of primary care for all pregnant and postpartum women allowing clients to access care through the Health Centre instead of their family physician. Without funding and support through First Nations Health Authority (FNHA) we would not have been able to obtain the services of a midwife in Masset which is a low volume birthing community. Shannon provides care to pregnant women up until the child is 6 weeks old at which time the community health nurse becomes involved in the family’s care. We have been busy with scheduling and getting our new programs in order, pretty much preparing for January when we will have Youth Program, Recreation Program and Rediscovery all working together to deliver programs. We have been meeting with Haida Gwaii Recreation, RCMP and schools to coordinate. Really looking forward to the new year!!! Throughout the year our weekly recreation and youth programs offer over 25 activities a month and serve an average 200 people/youth a month. After School Program is for ages 9-12 from 2:30-4:30. January to June operated 3 times per week with a partnership with Haida Gwaii Recreation Commission. From September to December the after school program began a focus on recreation and started the mini-ball practices after staff had attended Coaching Clinics with Aboriginal Sport and Recreation Council, hosted in our community hall. Girls Group: Ages 9-18; operated once a week from January to June. Partnership with Ask Auntie Program and Haida Gwaii Society for Community Peace. Prevention program for ages 13-24. A crew of youth are trained by local service providers to operate program and provide peer support and referrals. Organize activities every Friday night and as opportunities arise. Operates during School Year. This is a youth led activity. The youth center in open during the week for youth aged 13-24 to drop in and participate in activities organized by youth worker and youth. Typically, there is cooking, games, discussions and crafts. Youth also organize events on their own and the youth worker brings in workshops, guest speakers etc. as opportunities arise. In July and August each year, the Youth Program receives summer students. Each year these students develop a summer program to offer to young people in the community. In 2016 the summer students participated in the Rediscovery Program. In past years the summer program has partnered with Haida Gwaii Recreation Commission and hosted in-town Rediscovery day camps. A partnership with Council of the Haida Nation, this event occurs every May, alternating between Skidegate and Old Masset. For all island youth aged 13-24. A mock-governance event where participants join teams and participate in challenges to win a cash prize. Occurs every February at Gudangaay Tla’sgaa Naay Secondary. Local service providers facilitate workshops that youth from both island secondary schools register in and attend in lieu of regular classes for the day. Workshops focus on mental health issues at the request of youth. Occurs every 2 years at Hiellen Campsite since 2005. Youth aged 13-24 from across BC camp at longhouse site for 4 days with service providers and elders. In 2016, Rediscovery successfully hosted 8 camps at T’alang Stl’aang. The program is guided by the Rediscovery Steering committee consisting of representatives from OMVC, CHN and 2 community members. 2016 season consisted of 6 employees and an infrastructure project to rebuild a new cookhouse (still in progress). This program rebooted in October 2015. They have hosted 2 coaching clinics and 1 Referee clinic; assisted with Annual x-mas basketball Tournament and local community events: Easter, Aboriginal Day, Halloween, Christmas. The program worker coordinates Hall usage and liaises with local sports teams. Currently in the process of developing community Steering committee and Recreation Handbook. Worker change over occurred in October 2016. Noninsured benefits, set up travel to specialty appointments.